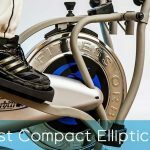 If you’re looking to start exercising at home, recumbent exercises bikes could be a great option for you to get started. Recumbent bikes are more affordable and stable than regular bikes, so they’re a great option for beginners. 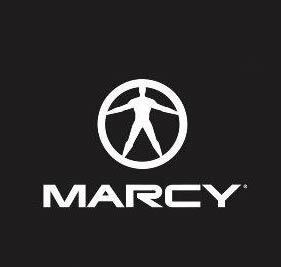 Here, we’ll look at some of the top models from a leading recumbent bike manufacturer, Marcy. We’ll be taking a look at three of the companies most popular recumbent bikes, the ME-709, NS-716R, and NS-40502R and comparing them to help you find the right one for your home. Even if you are considering different models, this buying guide will provide you with insights that will aid you in your search. Keep reading to learn more about Marcy recumbent bikes and how they can help contribute to a healthier lifestyle. 7 How do you choose between the ME-709, NS-716R and NS-40502R? 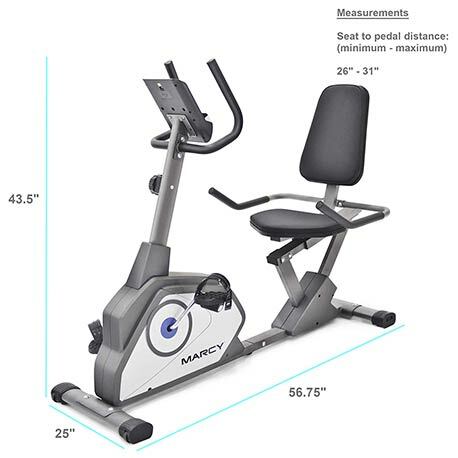 Marcy is a well-known manufacturer of recumbent bikes and offers a wide variety of models featuring different features and available options. Today, we’re looking at three of the brands most popular models to determine which one is the best of the bunch. 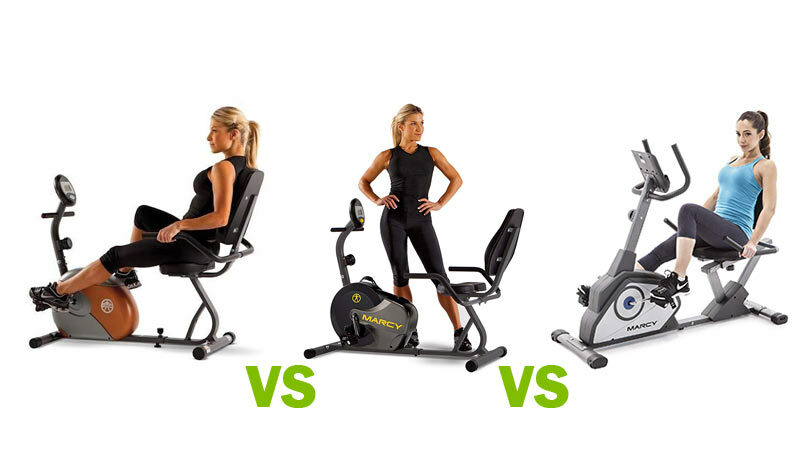 All three of these models are recumbent bikes, so they’re comfortable, easy to store, and great for beginners. If you want to get fit at home, these machines can be ideal for starting a new routine. However, there are several differences between these models so, in order to determine the best, they need to be analyzed in detail. 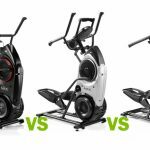 Continue reading to find out which model is the best of the bunch, and which one is best suited for your fitness level and budget. There are two categories of fitness bicycles, upright bikes, and recumbent bikes. 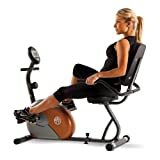 Upright bikes are models which have the pedals placed directly under the seat, like an actual bicycle, giving you the ability to pedal standing up. A recumbent bike, on the other hand, features a more comfortable seat that is situated lower and farther back than a traditional bike. The design of this type of bike reduces strain on your joints in comparison to upright models, and it’s also more comfortable. You can even work out hands-free, so you can occupy yourself with your favorite book, magazine, or digital media while you exercise. The recumbent bikes we’ll be looking at today have some features that are universally applicable to all of the models we’re examining today. This recumbent bike is a great option for anyone looking to improve their cardiovascular fitness level or lose weight at home. Like all recumbent bike, the ME-709 takes up little floor space in comparison to other fitness machines. 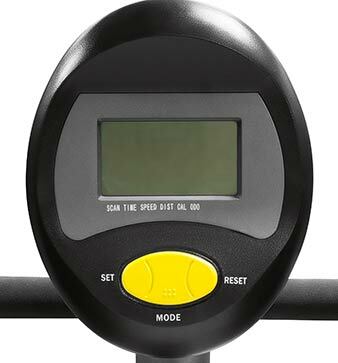 The magnetic resistance provides super-smooth pedaling so you can exercise comfortably and get the most out of your machine, and the bike’s easy-to-use LCD screen displays the odometer and feedback on your exercises session, like time, speed, distance, and calories burned. To make itself a less intrusive presence in your home, this bike features a step-through design. The seat stands independently from the pedal enclosure so that there is a gap between the two. This gap enables you to “step through” the machine instead of over it, as you would if the seat and pedal enclosure were connected, making it easier to get around in a smaller room. With this design, the bike is even better suited to use in a small home gym, and it won’t be as much of an obstacle in your room. Pedaling this bike is already a smooth experience, thanks to its magnetic resistance mechanism, and counterbalanced pedals make the pedaling motion even softer and more comfortable. Carefully balanced weights in the pedals provide superior support while keeping the rotation consistent and even. The pedals also come equipped with adjustable straps, so you can size them to fit snugly no matter what kind of shoes you are wearing. Customers who purchase this product find that it is easy to assemble and can be put together easily by most people. If you don’t want to assemble the machine on your own, there is an available service that will put it together for you. The ME-709 runs very quietly, thanks to its smooth pedal-motion and magnetic resistance, so you can enjoy TV or music without the noise of the machine interfering and keep your workout interesting. With easy assembly and operation, this bike is a great choice for most homes. The NS-716 is a great piece of home fitness equipment. The simple, light-weight design makes it compact, easy to store, and fun to use. It’s an ideal option for beginners, and it can help you burn calories and get in shape. If you’re looking for a great, entry-level piece of home fitness equipment, the NS-716R is the machine you’ve been searching for. 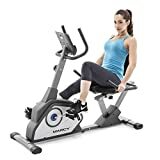 Whether you’re just getting into fitness or amateur athlete looking to mix up your cardio options at home, this recumbent exercise bike from Marcy can suit your needs effectively. This machine is fully adjustable so it can fit users of all sizes. Plus, it has several other design elements that enhance comfort. 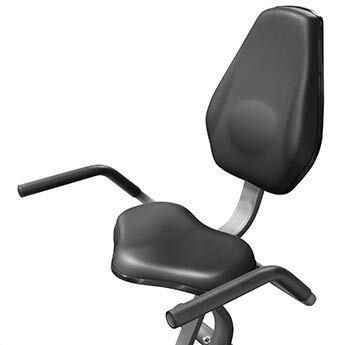 The seat has a contoured shape that allows the user to sit securely while using the machine, and its mold-injected cushion ensures your ride is comfortable. The handles are covered with foam to improve grip cushioning, and they’re perfectly sized for a snug grip. 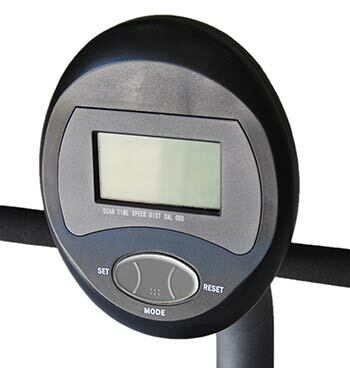 This model features an easy-to-read LCD display that allows users to easily track their exercise sessions. The display is powered by two AA batteries and provides several data points to help you gauge your progress. While the display is rather basic, it is an effective way to track your work that is much more simple than most, overly-busy fitness machine displays. The panel shows time, speed, distance, and calories burned; just the bare basics but enough to keep your workout on the track. The NS-4050 is the largest of the three machines and offers the most stability. With a steel frame and longer wheelbase, this machine stays sturdy during exercise. 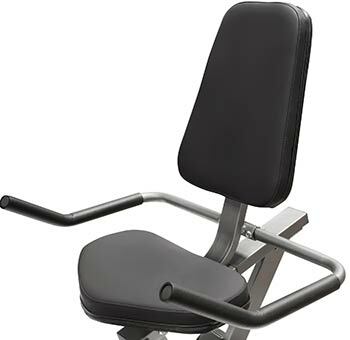 This makes it a great option for heavier individuals, and it can support users weighing up to 300 pounds. It’s slightly larger than the other models so it takes up slightly more floor space in your room, but it has a set of wheels in the base so that you can easily roll it into storage when you’re not using it. This bike is a great option for users who want a strong, sturdy bike who aren’t concerned about the bike’s increased size and weight. 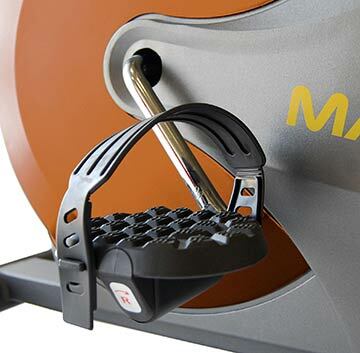 If you weigh over 250 pounds, you need a machine that is sturdy enough to stay stable during rigorous exercises. Even though some machines are rated to accommodate users weighing up to 300 pounds, there is a significant amount of variance in the machines’ stability. Stability is often balanced with portability, and most home fitness machines lean more towards the portability end of the spectrum. This machine, however, offers greater stability than the other recumbent bikes on this list. It’s eight pounds heavier than any other bike in this comparison, and its wheelbase has an increased area for further reduce unwanted movement. The NS-50502R features a full range of extras that improve user comfort and convenience. The ergonomically designed handlebars have a layer of vinyl foam padding so you can get a comfortable grip and focus on your workout. The seat can be adjusted to the user no matter what their height or leg length. Most individuals of average height will be able to set this machine to fit comfortably. The seat can be adjusted into five different positions that range from 36 to 41 inches, and the pedals have adjustable foot straps to keep your feet in place too. The seat also has a vinyl foam cushion to keep you comfortable and secure during your workout. How do you choose between the ME-709, NS-716R and NS-40502R? The ME-709 offers an excellent quality bike at an affordable price. While all of these bikes are inexpensive in comparison to most fitness machines, the ME-709 boasts an extra-low price of only $139. It has a great balance of portability and stability, and it’s fully adjustable to accommodate most body types. It’s a great way to start a new fitness program at home without breaking the bank. If you’re just starting a new in-home fitness program, you need a bike that is inexpensive and easy to use. The NS-716R has the lowest price tag of the three models on our list, and it’s also the lightest and takes up the least floor space. It even has a cup holder so you can keep your water bottle nearby while you exercise. The NS-40502R is the largest model of the three examined, and it’s also the best suited for users over 250 pounds. Thanks to its heavier steel frame and wider base dimensions, it can offer greater stability to heavier users, especially during rigorous exercise. 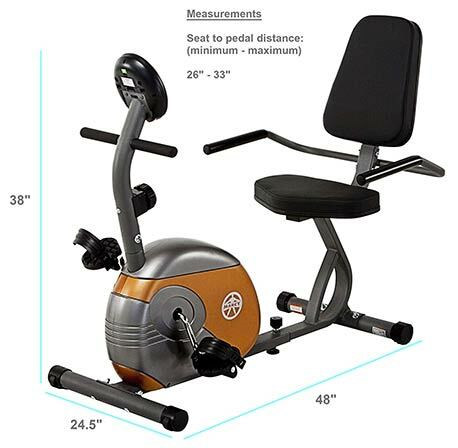 While all of these bikes off the same listed weight capacity of 300 pounds, this bike has an increased weight of 68 pounds and its foundation takes up the most floor space, so this is a solid exercise machine with a stable foundation. If size and weight aren’t an issue, the NS-40502R is a full-featured exercise machine that you can utilize in the comfort of your own home. Its heavy-duty steel frame provides increased durability and strength to the machine, so it’s sure to last you a long time. If you do have any issues, the manufacturer offers a two-year warranty that covers defects in workmanship and materials. The added stability of a longer base makes this machine even more comfortable for vigorous exercise, and it even has wheels in the base to make moving and storage even easier. These bikes can be assembled by anyone with basic mechanical knowledge. The assembly takes about four hours. You can get professional assembly for about $60-$80 on Amazon, depending on availability and the model in question. Yes. These bikes are great options if space is limited. They are often lightweight, the heaviest is less than 70 pounds, and all three models have wheels in the base so it can be easily moved around and put into storage. They don’t require a plug because the display units are simple and are powered by batteries, so there are no annoying cords to trip over or get tangled up in storage. Yes. All of these machines have adjustable settings that will help the machine fit your size. 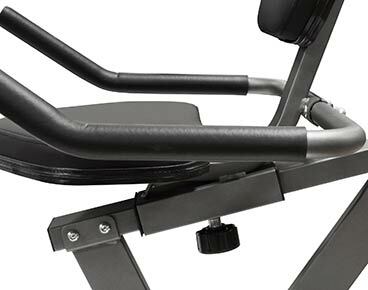 Please be sure to check the ‘adjustable length’ section of our table to see the adjustable ranges for each machine. This number measures the distance between the seat and the pedals so, to ensure maximum effectiveness, choose a model that fits with your frame. These machines are great for people who are just starting out with exercise. Recumbent bikes offer a low-impact exercise motion that is very easy on the joints. It’s even better than a regular fitness bike because you’re not standing over the pedals. Your weight is supported by the seat while you pedal, so there’s less weight on your knees, ankles, and other joints. No. These LCD displays on these bikes are battery-powered, so there’s no need for a cord. No, the displays on these bikes do not provide feedback on heart rate or any other vital signs. The displays show the following information: speed, distance, time, calories, odometer.